I had just escaped the harsh winter in Champaign during December, and returned home to India, for the break. While I seemed to be enjoying the 65°F weather there, it was apparently a cold morning for the rest of my family, and cold mornings are usually welcomed with a hot cup of coffee. As coffee was being served, my uncle and dad, who both have type II diabetes, got into an argument. My uncle was a strong supporter of artificial sweeteners whereas, my father preferred to skip out on any form of sweetening agent, since he had read articles on rumored side effects caused by artificial sweeteners. Amidst there conversation, as I enjoyed my hot cup of coffee with real sugar, I got curious. This controversy had not cropped up just once in my family, but I had seen similar arguments, multiple times, mostly when guests are being asked if they like sugar in their coffee or NutraSweet to name one kind of sweetener. So I decided to do a little bit of web surfing to find out how much information is out there about artificial sweeteners and their benefits/hazards. 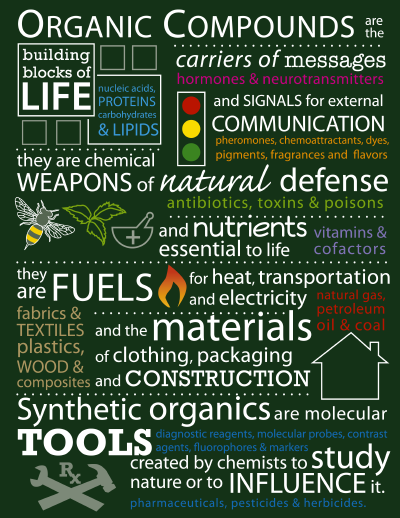 It was astonishing how many people had negative views on artificial sweeteners, and the most intriguing tidbit that caught my attention was the number of people and home improvement websites, that mentioned artificial sweeteners to be good pesticides particularly ant killers. As I glanced through these websites, I caught names of chemicals such as ‘Aspartame ‘and ‘Saccharin’. So I continued my light reading on the web, only to come across a bunch of horrifying articles, talking about neurological problems, weight gain, seizures and even certain forms of cancer. More than just curiosity, this became important, because, diabetes was significantly common in my family, and the consumption of artificial sweeteners was present on a daily basis. If there was some scientific evidence to all these claims, I felt like it was my responsibility to alert everyone I know, about these developments. This thought lead to a ton of questions, what exactly was Aspartame? How was it made, who discovered it, what was the evidence behind it being dangerous, how did it cause these deadly side effects, what is the chemical composition, how much do we consume on average basis, and how many products contain these chemicals. As I read through the article, it mentioned a lot of the studies that had been done on artificial sweeteners over the years. Though the writer had arrived at a conclusion that artificial sweeteners, found in today’s beverages, aren’t dangerous to health, the studies did have results that seemed to have results with conflicting opinions or data that could not be interpreted properly. I felt like I needed to see these studies first hand and read the methods and results to help make my decision on artificial sweeteners. FDA approval may have been granted, however, FDA approval is granted to a lot of unhealthy products, which we consume and that have been linked to modern diseases. Diabetes, for example is a lifestyle diseases that can be prevented, if people are educated on eating right and exercising. The question however is whether FDA approval on food products only tells you that the consumption of that product will not give you any life threatening side effects. Maybe ending up with side effects is also greatly dependent on usage and accumulation of these chemicals in your system. My first step was to understand the studies that mentioned links with cancer, this study was found in the Annals of Oncology; I searched for this information, using Google scholar, with the keywords cancer and artificial sweeteners. The first hit from this search resulted with me finding this paper. As I read through the abstract, it spoke about the studies done on two groups of artificial sweeteners, the ‘first generation” sweeteners, which contained these major products; saccharin, cyclamate and aspartame. The second group was called the “new generation” sweeteners consisting of acesulfame-k, sucralose, alitame and neotame. The abstract went on to mention the studies done on animals and the bladder cancer inducing rates of artificial sweeteners, they seemed to have concluded, on the lines that these risks cannot be literally translated to humans, due to the immense differences between rats and humans. The one thing in this abstract that stirred my curiosity again, was the mention of case controlled studies, I did not know the meaning of this form of study and after a quick Wikipedia search understood that these were observational studies, where in a particular cohort of people with a disease, researchers compare and contrast to identify the factors that could be contributing to the disease. The results of the case controlled study on risk of cancer for those who used artificial sweetener heavily (>1.7g/day) seemed to have shown an increased risk of cancer. When I read the article in a lot more detail, it gave me a really good idea, of how the artificial sweetener industry even started, what was the very first sweetener i.e Saccharin. 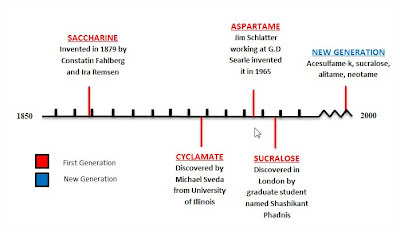 So, I decided to map a little timeline of the history of artificial sweeteners for this post. Though I seemed to have learnt a lot more from this article it didn’t really have enough statistical evidence to back up the claims on the case studies or the study done on rats for incidences of bladder cancer. So, I set out to do another search, this was when it struck that there must have been a lot of studies done, while the new sweeteners were awaiting their FDA approval. So it seemed more plausible that I would find good material, if I did my search on the toxicology and safety evaluation of artificial sweeteners. However, at this point, I felt that narrowing it down to one particular sweetener would make more sense. I realized that if I did a random Google search then I would be hit with too many options such as Saccharin, cyclamate and Aspartame to name just a few, so I decided to walk into my kitchen and see which ones we had at home. And that was how I ended up with Equal, which is mainly composed of Aspartame. And to be honest compared to the other options this one had intrigued me the most. Aspartame is composed of two amino acids, and when in the body it breaks down into the amino acids aspartic acid and phenylalanine, as well as a really small amount of methanol. “Aspartame: A Safety Evaluation Based on Current Use Levels, Regulations and Toxicological and Epidemiological Studies”. It almost felt like the researchers, knew I would one day be going through this extensive compilation of papers, to write this post, which I hope will help people make decisions on what they are consuming. As much as I would like to, I don’t think I will be able to summarize all the information provided to me, but I selected the ones that I was really interested in. The data in Fig 2. represents the results of a study that was done by the European Ramazzini Foundation of Oncology and Environmental sciences. Aspartame was added to the diet of a group of rats between 0 to 100,000ppm the levels presented above. This corresponded to normal doses between 0 – 5000 mg/kg bw/day. These animals were allowed to live until spontaneous death. They results showed that there was a dramatic weight loss and greater incidence of lymphomas and leukemia in the treatment group of rats. They had statistically significant increased incidence, of transitional cell carcinomas of the renal pelvis and ureter. Unfortunately, due to a high incidence of bronchopneumonia a lung infection that many of the rats acquired, the EFSA (European Food Safety Authority) decided that it is more likely to have been the casual factor for the lymphoma and leukemia. Aspartame like mono sodium glutamate is a neuroexcitatory compound, and when newborn mice were injected with mono sodium glutamate they had shown a marked increase in obesity in their later life. This started the research involved with aspartame’s effects on weight gain. In popular media, artificial sweeteners are promoted on the basis of being low calorie, which is why aspartame is used in Diet coke. Rockhold et al, used NDMA (N-methyl – D aspartic acid ) to induce lesions in the hypothalamic region of the mice. The body weight, food and water consumption along with urine output were monitored for 26 days, and surprisingly, unlike monosodium glutamate, the rates injected with NDMA, showed a significant reduction in food intake and body weight gain. After several studies were done on this issue, it was recognized that the intake of aspartame actually did aid in weight reduction. Double blinded clinical studies done on humans, also led to the same conclusions, and showed that aspartame actually has the potential to aid in long term weight control. Basically, after reading and interpreting these studies and the results, I was tempted to side with the FDA, that aspartame and artificial sweeteners may not pose a threat to us. However, the more I thought about it, these studies were based a stipulated consumption. People have different likings when it comes to how sweet they would like their coffee or tea to be, and also, how much coffee or tea they drink on a daily basis. Aspartame is found in almost 6000 other products, some major products, like Diet Pepsi or Diet Coke, which are part of multi-billion dollar industries. These things could certainly affect the political interferences with FDA approvals. Aspartame in moderation, potentially would not be very harmful, but the more we think about the usage of aspartame, I come to realize, that it’s part of almost every product, that you would want to avoid, if you wish to lead a healthy lifestyle. Now as I go back to what my father and my uncle were arguing about, I think I know that side I would like to select, if I have an option to avoid consuming products with artificial sweeteners, I think I would most likely do it. Since my father, leads a very healthy lifestyle, occasionally having an artificial sweetening reagent in his drink, will not do him as much harm as he seems to think. Hopefully my post will educate my family on artificial sweeteners enough so that next time, we can all enjoy our tea or coffee, in some peace and quiet. 1) Magnuson, B. A., G. A. Burdock, J. Doull, R. M. Kroes, G. M. Marsh, M. W. Pariza, P. S. Spencer, W. J. Waddell, R. Walker, and G. M. Williams. "Aspartame: A Safety Evaluation Based on Current Use Levels, Regulations, and Toxicological and Epidemiological Studies." Critical Reviews in Toxicology 37.8 (2007): 629-727. 2) Weihrauch, M. R. "Artificial Sweeteners--do They Bear a Carcinogenic Risk?" Annals of Oncology 15.10 (2004): 1460-465. 3) Blundell, J. "Paradoxical Effects Of An Intense Sweetener (Aspartame) On Appetite." The Lancet 327.8489 (1986): 1092-093. 4) "Timelines." Wikipedia. Wikimedia Foundation, 05 Mar. 2012. Web. 04 May 2012. .